100% coir, PVC backed entrance matting - does not fray. Available in 7.5m of 12m rolls, or cut lengths. Hard flooring isn't ideal for all workplaces there are more slip risks with hard floors, so it would be ideal to have something which can absorb water and remove dirt from footwear to make the environment safer. Our coir entrance matting is ideal for placing over hard floors as it has high moisture absorbency, helping to significantly reduce slip hazards. This matting doesn't fray as it is made from 100% natural coir on a PVC backing to create this excellent entrance matting. Thanks to the natural material this also means the colour is natural, which will suit almost any environment and the thickness of this matting is a 17mm gauge. The mats are available in a choice of three lengths; 1m, 7.5m or 12m, as a cut length or mat and there is also a choice of two widths; 1m or 2m. 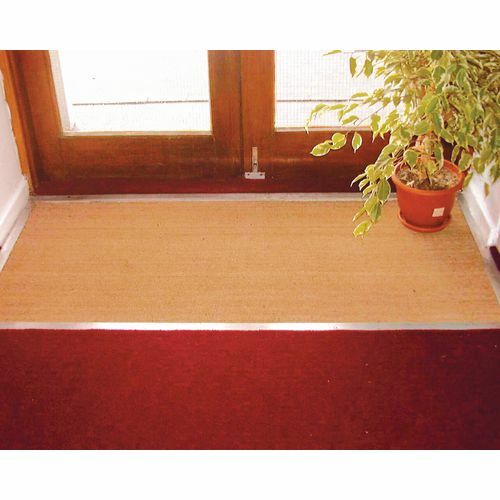 Our coir entrance matting is ideal for placing over hard flooring to absorb moisture and dirt from people's footwear. They are available with a 12 month guarantee and FREE UK Delivery.